We'd argue that 2016 hasn't (thus far) been a vintage year for computer games, yet while system-selling titles have been few and far between, there's been no shortage of cutting-edge hardware to tempt our wallets. Nvidia has taken charge of the high-end space with GTX 10-series GPUs, AMD has brought some much-needed competition to the mid-range with the Radeon RX 4-series, and both the Xbox One and PlayStation 4 have been revamped in the form of slimmer models. There has been significant development in the laptop space, too, with Nvidia bringing its 10-series parts to the mobile arena. We've already seen the GeForce GTX 1070 featured inside an impressive Asus laptop, and today we turn our attention to something bigger, more powerful and far pricier, the £4,399 MSI GT83VR 6RF Titan SLI. The name's a mouthful, and so too is the machine. Measuring a rucksack-ripping 456mm x 330mm x 49mm in size and weighing a hefty 5.5kg, this latest incarnation of MSI's Titan SLI formula is one of the biggest and heaviest laptops that money can buy. You could argue that it's only a laptop by name and the system makes more sense when considered as a fully fledged desktop replacement. There's enough horsepower here to outgun most traditional towers, and if you do need to cart it around, there's no need to worry about packing up a monitor and peripherals. Usability considerations shouldn't come as a surprise to regular readers, mind, as this isn't the first time a Titan SLI machine has passed through our radar, and from the outside it doesn't look as though a great deal has changed. Build quality is adequate but not spectacular, with MSI favouring large pieces of plastic interspersed with metal, and the sheer size of the system is such that the chassis is unlikely to ever be considered pretty. Still, being roomy means ample space for hardware while connectivity options are plentiful. Starting on the left edge we have a Blu-ray writer, audio-out powered by an ESS Sabre HiFi DAC, three USB 3.0 ports, SPDIF-out and headset and microphone jacks. Over on the right you'll find a further two USB 3.0 ports, while around back there's Killer Gigabit Ethernet, a connector for the external power supplies (yes, plural), as well as HDMI, mini DisplayPort and a so-called SuperPort that permits a Thunderbolt 3 or USB 3.1 connection. Should you decide to take this beastie on your travels, there's WiFi courtesy of a high-end Killer Wireless-AC 1535 adapter. Open the lid and the sense of familiarity continues. The impressive 4.1 audio system remains intact, as does the backlit mechanical keyboard, while the somewhat awkward trackpad is still unusually narrow and doubles as a numpad. The biggest disappointment is that the display hasn't been upgraded. MSI will argue that 18.4in options are in limited supply, but nevertheless, there's something not quite right about a £4,399 laptop shipping with a 1,920x1,080 panel. A shame, really, as the underlying GTX 1080 GPUs deserve better. 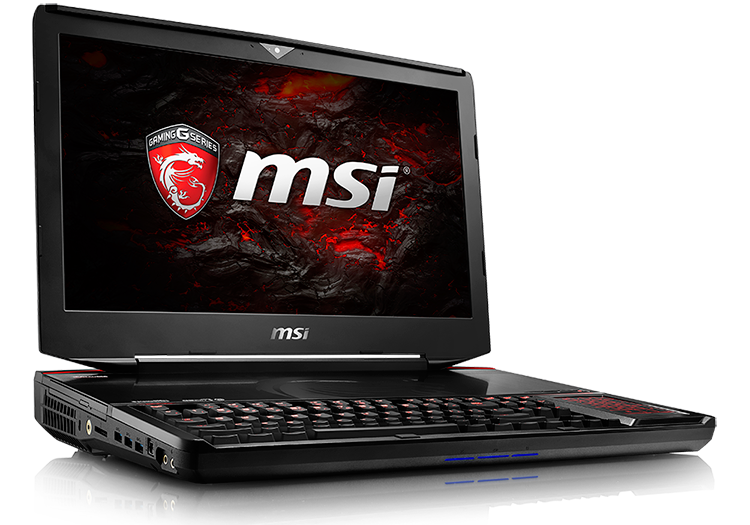 MSI's Titan branding could lead to a bit of confusion over which graphics chip is powering this particular machine. Nvidia's Titan X is strictly a desktop solution, yet the GT83VR 6RF has even greater potential by employing not one but two GeForce GTX 1080s in an SLI configuration. As illustrated by the above table, Nvidia has blurred the lines between its desktop and mobile parts, meaning that the latter is no longer a hamstrung alternative. GTX 1080 for laptops features a full complement of 2,560 shaders, 160 texture units and 64 ROPs, allied to 8GB of GDDR5X memory via a 256-bit bus. All that's changed, in fact, is the core clock, which falls slightly, from 1,607MHz to 1,556MHz. 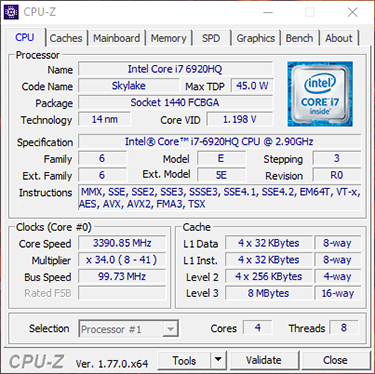 Boost clock remains intact, however, at 1,733MHz, and the performance gap between desktop and mobile variants should be practically nonexistent. Dual GTX 1080s in an 18.4in form factor is a remarkable feat, yet having never seen this level of performance in a laptop, we can't help but approach the 2016 Titan SLI with a raised eyebrow. Will the chassis be able to cope with the thermal demands of the two GPUs? 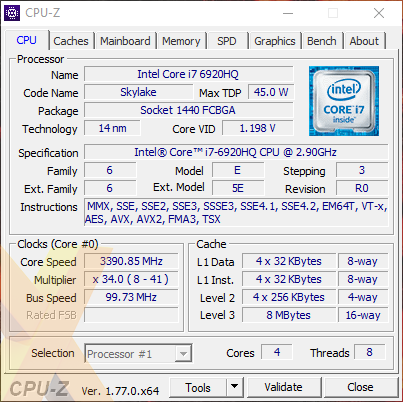 Will the CPU - in this case a Core i7-6920HQ overclocked to 4.1GHz - prove to be a bottleneck? 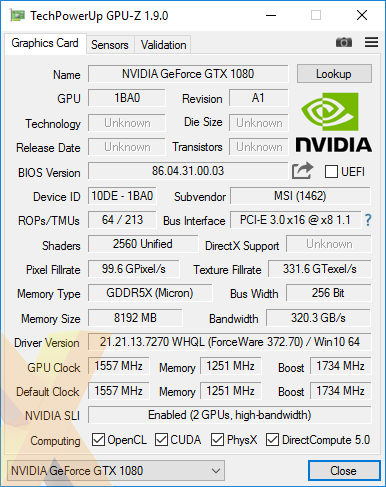 Will modern DX12 games perform favourably on an SLI configuration? And, seeing as last year's model would at times suffer from battery drain even when plugged in, how will MSI deal with the power requirements this time around? The upcoming benchmarks will answer most of the questions, but we can get the power-requirement hurdle out of the way by confirming that the GT83VR 6RF Titan SLI makes use of two large, 330W supplies. 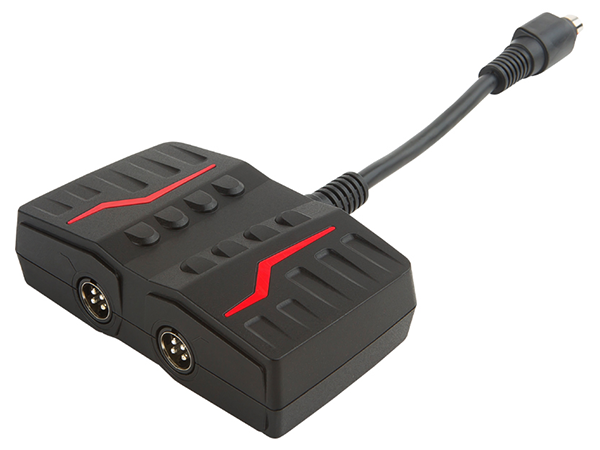 The duo attach to a Y-adapter that then connects to the laptop, and though it's hardly an elegant solution, this setup ensures ample power at all times - just remember you'll need two mains power sockets to keep the juices flowing. Now, let's smash some benchmarks, shall we?